October 2018 saw Scotland’s and Britain’s largest women’s strike for equal pay. It represented a significant change in Scottish union strategies around equal pay because it included a combination of public campaigning and industrial muscle. It provided inspiring images of working class women taking to picket lines and demonstrations in Glasgow in numbers never seen before. It wasn’t just a strike – it was a mass action by the women of Glasgow to demonstrate their power and they won. Since 2004, equal pay claims in local government have been largely pursued and managed through legal processes, where the right point of pressure was applied either through the courts or local politicians Claims were safely delivered to local bargaining structures, where council officers, unions and private solicitors would negotiate a settlement which was then presented to individual claimants. This delivered an individual model of union services by the unions’ legal teams. What brought 8,500 Glasgow City Council (GCC) employees to strike was 12 years of being paid less than they deserve or are due. The experience of previous settlements had fuelled scepticism amongst members who were determined to make sure that this time a full and fair settlement would be delivered. The largely female workforce of homecare, catering and cleaning workers in Cordia had been pushed to the limit and the existing union organisation was not an effective machine they could use in challenging these attacks. The uncomfortable truth was that some of these employer attacks were in fact delivered through collective bargaining agreements by a series of local, single union deals. In 2012, UNISON membership was just 592 in Cordia. 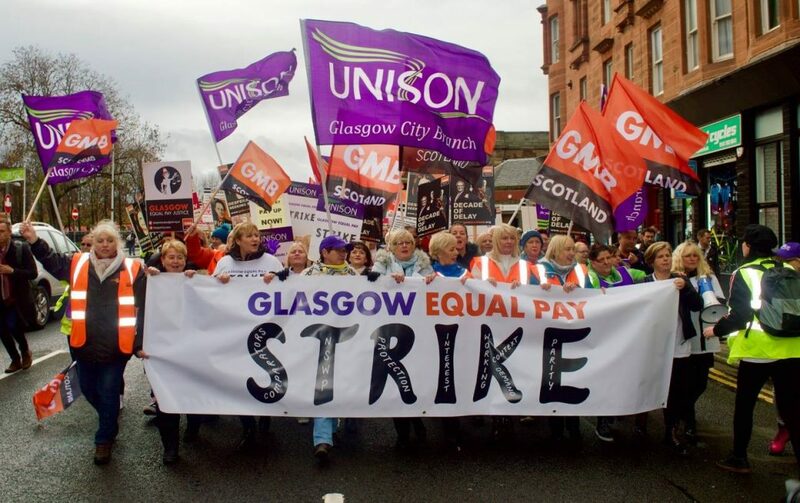 However, UNISON Glasgow City branch had maintained a principled stand both on resisting the imposition of some of these attacks on pay alongside legal battles to maintain the link to GCC as the employer to allow for equal pay cases to continue. The background to this was that UNISON was the largest union in the city overall and had led 14 strikes since 2007 over a range of pay issues across the council family, most involving predominately female groups of workers. 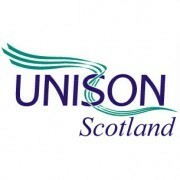 UNISON Scotland directed organising resources to Cordia and the branch established a team of activists and organising staff committed to supporting the Cordia workers. Membership increased, slowly – 636 by 2013 and the 784 by 2014. But out of a workforce of just over 7,000, it was not enough to take on the employer. In 2015, home carers were targeted again, this time through a shift reform moving to 7-day working with 10-hour shifts split over a 14-hour period. This represented the double edge to GCC’s pay policy – discrimination in the pay system, and multiple changes to working arrangements to reduce pay for women. UNISON litigated the pay system and refused to agree the shift reform for women. Unable to fight it collectively, we built an organising strategy which campaigned against GCC’s measure, while supporting individuals through the grievance process. Crucially, the branch hosted a series of open meetings for homecare members where they could hold the union accountable, plan the next campaign steps and provide support to each other. These member-led meetings became the model which served the branch in the equal pay campaign, producing a whole team of new stewards in homecare. The branch went from no home carers as stewards to up to 8 in 2017. The membership grew substantially during this period from 1314 in 2015 to 1461 in 2016. This was ‘bottom up’ organising, building a union infrastructure in a membership with no real workplace except clients’ homes and branch campaigns which came from the members, looked like and felt like the membership. In 2016, 200 UNISON members, who were primary and nursery school janitors in Cordia successful industrial action over a grading issue. The action continued for 20 months and in August 2017 the janitors won an immediate 6% pay rise worth £1,184pa. It was the first time Cordia had been challenged by industrial action. A crucial gain was the political traction the dispute brought and which allowed the branch to raise a number of demands in the 2017 local government elections: the janitor’s dispute should be resolved; Cordia should be brought in house; and all outstanding equal pay cases should be settled. The SNP and the Green party committed to all of these in their 2017 elections manifesto. So, the #Justice4Jannies campaign used imaginative campaigning techniques, developed a relationship with parents and, crucially, proved that strikes can win. It had a profound effect on the wider Cordia workforce. The branch then moved to step-up its organising in the school cleaning and catering sections of Cordia with a focus on the loss of temporary staff, overwork and health and safety. Again, new stewards came to the fore to lead these campaigns. In May and August 2017, two rulings were published challenging both protection payments and crucially the legitimacy of the entire pay and grading scheme at GCC. In preparation for this, UNISON Glasgow City branch hosted community based members meetings aimed at Cordia new members on the issue of equal pay. Many union members had gone to the private solicitors, Action for Equality (led by Stefan Cross), for their equal pay claims and those claimants had organised online in a Facebook group and were already campaigning individually, lobbying councillors etc. UNISON acknowledges the key role played by Action for Equality in the story of how equal pay was won in Glasgow. It’s fair to say an anti-union narrative amongst the claimants was evident, many felt let down by previous compensation payments and felt the unions could have done more. Rather than debate the issue, the UNISON branch was determined to demonstrate to those women that it was member-led, reaching out to the claimants’ group, assisted by the already good relationships which UNISON and Action for Equality legal teams had developed by combining forces in the courts. On 21 October 2017, the campaign focus switched from union lawyers to the local branch. Crucially, some of the claimant leaders attended along with UNISON activists in homecare, janitorial services, and two new occupational groups (education and administration). The same organising methods developed in Cordia were used. So rather than have a hierarchical dialogue from leaders to members, we used horizontal organising conversations which were member led. We tried some new techniques inspired by the work of Jane McAlevey (see Scottish Left Review, May-June 2018). Using a Power Structure Analysis (PSA) to identify the key player and allies/obstacles to delivering a full and fair settlement allowed us to collectively agree the very first steps in our campaign plan. The members were insistent they wanted a united campaign bringing together all the claimants irrespective of who the legal representatives were – whether UNISON, Stefan Cross or GMB – and demanded we work together with all campaign activities led by members. The campaign meetings were open to every member, held every 5 then 6 weeks and ranged in attendance from 60 to 140. The PSA continued to be used at each meeting till around June 2018. The branch decided that the campaign would be led by women including all rallies, demonstrations, media comments etc. To develop leaders from the campaign, these women would be become representatives on the branch’s newly created Pay Justice Forum set-up to oversee the introduction of GCC’s new Job Evaluation and Pay and Grading schemes. Those new leaders would then participate in the branch structure and ensure that female dominated occupational groups would ast have power in the branch and negotiating table. This organising strategy brought challenges and the meetings were sometimes difficult with branch leaders facing the heat of the members’ passion on more than one occasion. But throughout the process , members held the power. So when striking was necessary, members delivered a successful consultative ballot in May 2018 and statutory ballot in September 2018. UNISON membership increased from 1526 (2017) to 2313 (2018) and remains at this level in 2019, with 2341 members. The strike on 23/24 October 2018 was a profound experience for members. An opportunity to strike for equality – a strike where the result could deliver a crushing blow to a pay and grading system which had systematically discriminated against women workers and with mass participation. The nature of the workplaces our members work in – schools, nurseries, libraries, care homes, museums, and homecare in communities – meant that our picket lines were amongst the noisiest and most visible ever seen. The atmosphere at the demonstration and rally was incredible with a minute’s silence for those claimants who have passed away and the speeches by women who care, educate, cook, and clean were some of the most memorable and moving speeches we have ever witnessed in the city. The hard fought legal battle, the campaign and the strike won compensation of over £548m for the hardest working people of our city. It will be one of the single, largest redistributions of wealth our city has ever seen. The challenge is whether the wider union movement in Scotland can learn lessons from this dispute. The lessons are that i) building women leaders means making space at the key tables for them, both in the union and with the employer; ii) power is built by member-led participative structures that put the industrial demands of pay equality; and iii) equal pay must be mainstreamed into the ordinary workplace demands that unions make. Jennifer McCarey is an Area Organiser for UNISON Scotland and Brian Smith is the Branch Secretary of City of Glasgow UNISON.